How does ALPHA-CAT Cannabinoid test kit works for THC and CBD ? 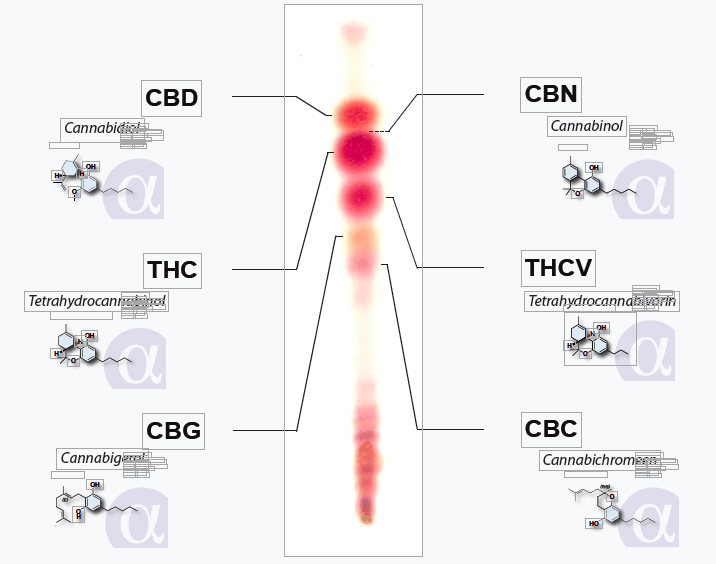 alpha-CAT is a Cannabinoid Analysis Tool which combines the simple analytical technique of thin-layer chromatography (TLC) with specific thin-layers and developing fluid. 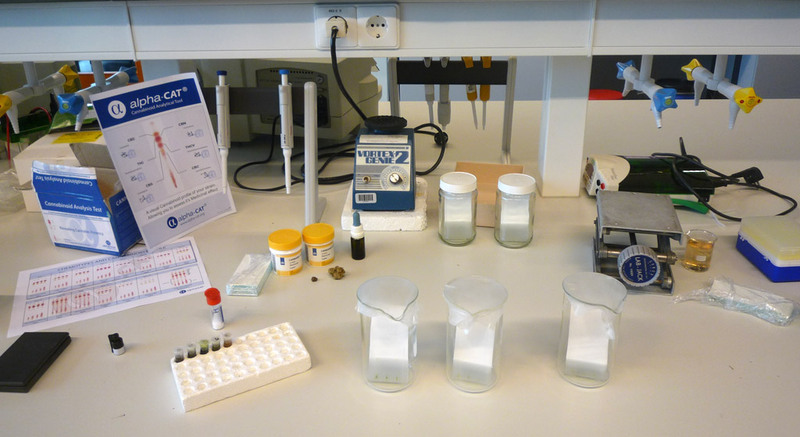 A minimal amount of material (0.1 gram) is needed per sample to provide a unique and effective way of analysing the cannabinoid profile in various mixtures such as plant parts of cannabis, trichome resins, oils, tinctures and edibles products (ice-creams, cookies, teas…). A symptom-cure guide helping to determine which strain best helps to alleviate specific symptoms. *Each TLC plate allows for testing 4 lanes. A full analysis uses all 4 lanes for 1 strain. To get a chemotype print of your strain, 1 line is sufficient: 4 strains can therefore be analysed on 1 TLC plate. The alpha-CAT system solves the issues involved with simultaneously separating cannabinoids in a simple, cost-effective way, providing a chemical profile for each sample. The alpha-CAT method separates some of the neutral and acidic cannabinoids which are rendered distinct from each other with bright colored spots. The chemotype profile shows the number of cannabinoids and their relative concentrations. The higher the concentration the bigger and more intensely coloured the spot is. alpha-CAT gives the opportunity to determine the cannabinoids present in each material sample and reveals the levels of each individual cannabinoid present in terms of its concentration. The alpha-CAT method enables anyone, regardless of scientific background, to define the active cannabinoid profile in a wide range of medicinal materials (flowers, resins, concentrates, cosmetics, tinctures, edibles and most other cannabinoid containing products). After colouring the TLC plate by dipping it in a dye solution colored spots will appear immediately. The number of different spots depends entirely on the plant used (genetics) and the environmental parameters during cultivation. The bigger the spot is, the higher is the concentration. The combination of different spots is called the chemotype of this particular plant (strain). 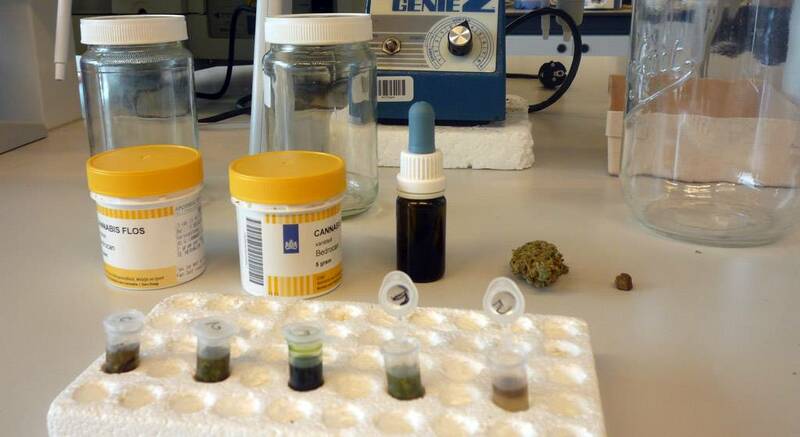 Samples derived from it, such as the dried flowers, edibles, oils and hashish will differ somewhat in composition and won’t show the same cannabinoid profile (or print). Each colored spot on the plate represents a cannabinoid. THC Calibration Chart & TLC plate results. Use the calibration charts from the kit for proper reference. The combination of all cannabinoids present in a particular strain will be responsible for the pharmaceutical effects as well as the side-effects commonly reported and will range from an ultimate high feeling/experience (only THC present) to a heavy, “stoney”, “narcotic” sleep provoking strain with low THC when compared to its levels of CBD and CBG or with overall high levels of CBD and CBG. Small differences in cannabinoid levels of THCV, CBG and CBC between strains results in tremendous differences in perceived effect. Alpha-CAT® kits are fully compliant with the guidelines of the World Health Organisation concerning safety and quality of medical plant materials (WHO/PHARM/92.559). Our methods meet the guidelines and recommendations of the Food and Agriculture Organisation (FAO) Codex Alimentarius. All of our kits comply fully with Hazard Analysis Critical Control Points (HACCP) guidelines. Before conducting experiments, read the manual carefully! Contact us if you have any questions. We remain available for any questions. This is very interesting. Are these tests supposed to be used by consumers to test their own CBD products?? Exactly, it is made for people to do their own cannabinoid testing (there are so many brands that cheat on %). Also, some companies and social clubs use it, you get a result fast, it’s cheaper than laboratory testing and you can do it yourself. The results have 2-points margin of error. Let us know if you need any information, we remain available. Would this be a substitute to third party testing? Would it be legitimate for the U.S.? Our testing method allows you to measure the concentration of the 6 main cannabinoids and their acid forms with a 2-point margin of error. If you are looking for a 0.1% precision, you should send your sample to a specialized laboratory. We provide a personal training with our mobile lab allowing you to be certified and legitimate. We remain available if you need more information. I have purchased your mini kit and then a refill kist as well. I need to know: Does the percentage % shown mean that the extract oil contains that much QUANTITY of the cannabinoid? Example: if THC shows 50% and CBD 12%, then does it mean in a 1gram sample, 500mg is THC and 12% is CBD and so on? Exactly, if those are your results, so in 1 gram you have 500 mg THC (50%) and 120 mg CBD (12%). Let us know if you need any other information, we remain available. Could you supply MSDS forms for all the chemicals you use in your kits. We send a user manual with our test kits, where you can find precautions for use, method of use and all the details needed. The manual is also available online (PDF version). Would you be interested in buying one of our test kits ? Let us know if you need any information or if you have any questions. I’d like to ask about the illustration of the THC Calibration Chart & TLC plate results. In your example, what is the content of THC? I cannot place the stick result to the calibration line. For all questions, please send a mail with our contact page. Hi there, does your testing kit deliver results above what is shown on the scale? For example your chart goes up to 20% THC, but I would like to check for results up to 65%. Or do you provide another testing kit that does this? Amazing kit for people to do cannabinoid testing. Are you able to determine cannabinoid (CBD/THC) profile from a plant in vegetative state? How far along does the plant need to be to determine the CBD/THC profile? If so, this will be a great tool for breeding. How many tests does the small kit do and are there refills or do i ha.ve to keep buying a kit when i run out. Hi, How can you perform spot identification when no standards are run? Could this testing be used to test cbd content in Urine. There is a NEW (Feb 2019) Militry directive specifically banning ALL CBD, and ALL hemp products, including foods. It indicates they specifically test for cbd’s. (Former concern was slight amounts of THC from CBD, but this test does test for THC and CBD. I’m a massage therapist makes as salve using thc free hemp cbd isolate. I have military clients that are no longer allowed to use it. I’m also interested in having my final product tested to indictate quality. could you be so kind an help me out? Can you explain on what it depends if with the regular kit I can analyze 10 or 40 tests? what is the procedure for testing high alcohol content tinctures? Is it possible to ship the kit to Portugal and how much would the shipping cost? Hi, yes we delivery all over Europe. When selecting your order, Shipping price will appear.